Rare’s Sea of Thieves has been delayed to early 2018 but in the meantime, the developers are working hard to polish the game and foster a cozy community of fans in preparation for the launch. 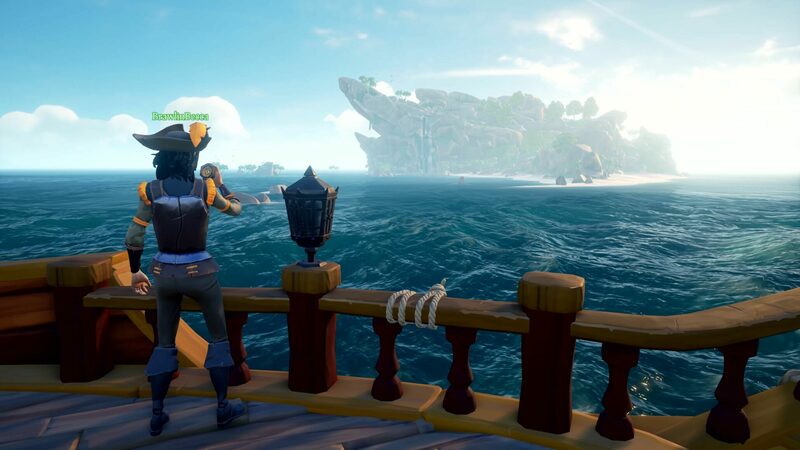 In fact, speaking with The Official Xbox Magazine (September 2017, issue #154), Executive Producer Joe Neate said that Rare’s ambition for Sea of Thieves is to create nothing less than the most fun and welcoming multiplayer game ever made. This type of game needs a positive, engaged, welcoming community that is knowledgeable. They’re gonna help new players. They’re gonna be making tutorial videos. They’re going to bring people into their crew. And so we’ve built this massive, positive, engaged community, and it blows my mind. The game’s not out yet and we’ve already got so many super fans we could have a Sea of Thieves festival! It’s the most fun and welcoming multiplayer game ever. That’s our ambition. Our community on the forums, they have their own set of rules, kind of like a pirate’s code. And one of those is that you’re not allowed to swear on the forums, which is kind of funny because I’ve been modded twice by our community! We’ve got a bunch of people we call the ‘deckhands’, who are people we’ve appointed to moderate the community, and they love catching me swearing, because I just get passionate about things. I love that they’re doing that. So I’m going to work with the community to create a pirate’s code for the game, because we want people to be respectful in Sea of Thieves. We want to set our stand early, but work with our community to set the right sort of guidelines, the right sort of rules, and work with them to enforce it. I’d love it if this was someone’s first multiplayer game – you know, they’ve never really wanted to get into it before, they’ve just been put off by the fact that it’s really competitive or it could be toxic. We could make something that’s far more welcoming but still amazing fun. The Insider Program is basically our way of building that positive community, and learning how to manage and communicate with a community. We send them weekly Insider emails, we give them early access to the videos we create, we engage a ton on the forums with them. Sea of Thieves is due to be available on Windows 10 PC and Xbox One with cross-buy and cross-play (it will be part of the Xbox Play Anywhere program). Meanwhile, check out the latest progress report from last week; we’ve also embedded the newly published developer diary on the recent improvements made to gunplay.